From a Euro-Atlantic perspective, relations with Russia since the collapse of the Soviet Union have proven challenging. On numerous occasions, the United States and the North Atlantic Treaty Organization (NATO) have reached out to the Russian Federation in an attempt to build a cooperative security framework. While inroads have been made over the years, the overall relationship has been hit or miss, leading to regular resets of bilateral U.S.-Russia relations and periodic efforts by NATO to reengineer its relationship with Russia. In 2011, in the wake of an upswing following the U.S.-Russia reset policy launched by the Barack Obama administration and the positive spin on NATO-Russia relations in the aftermath of the 2010 Lisbon Summit, experts and decisionmakers already wonder whether the reset will continue to move forward or whether relations with Russia will again run aground on longstanding differences. 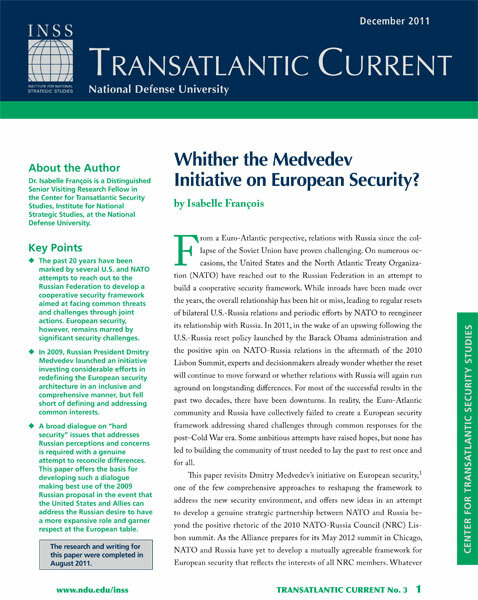 Whither the Medvedev Initiative on European Security?